Are you already dreaming of the wonderful honeymoon that’s waiting for you right after the wedding day? Find out why you should have your honeymoon photos taken by a professional! 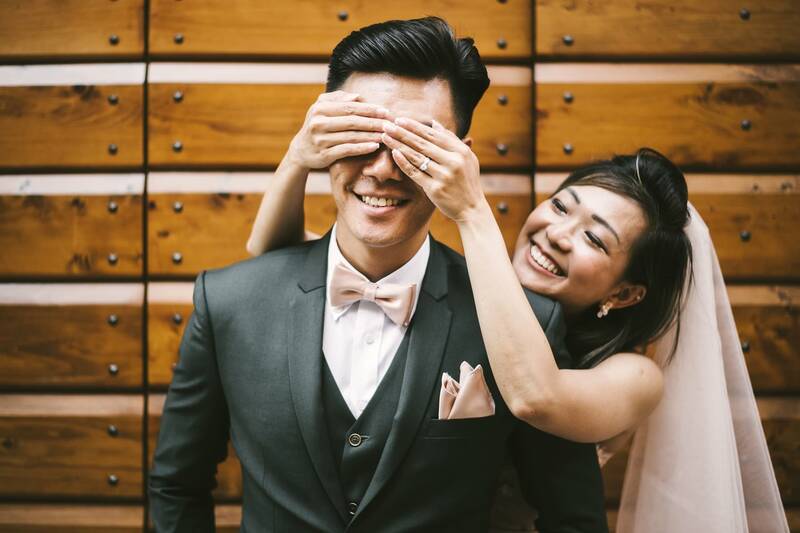 In the months leading to your wedding day, you probably had so much to think about that you didn’t consider your honeymoon photos… let’s find out why you’d better do that! Of course you want your wedding to look amazing and you plan everything in order to achieve that goal. 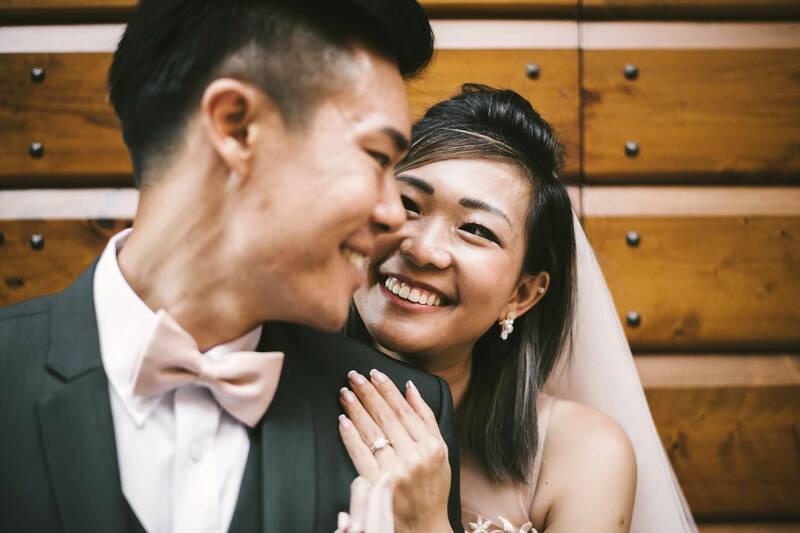 You also make sure to have memories of that day to cherish forever – that’s why you hired a wedding photographer. But isn’t your longed-for and well-deserved honeymoon worth remembering too? Let’s face the truth: the wedding day is incredibly epic and emotional… but it’s also hectic and a bit stressful. Can you imagine the relaxed and heavenly feeling you get during your honeymoon, instead? It’s like a magic bubble where all you have to do is enjoy the love of your life and your wonderful hideaway. This is definitely worth creating photographic memories, don’t you think? Yes, you could do that yourself with a smartphone and a compact camera – but you wouldn’t get much more than a selfie or a lousy photo taken by random tourists. If you hired a photographer for your wedding day… why not do the same and get honeymoon photos taken by a professional? 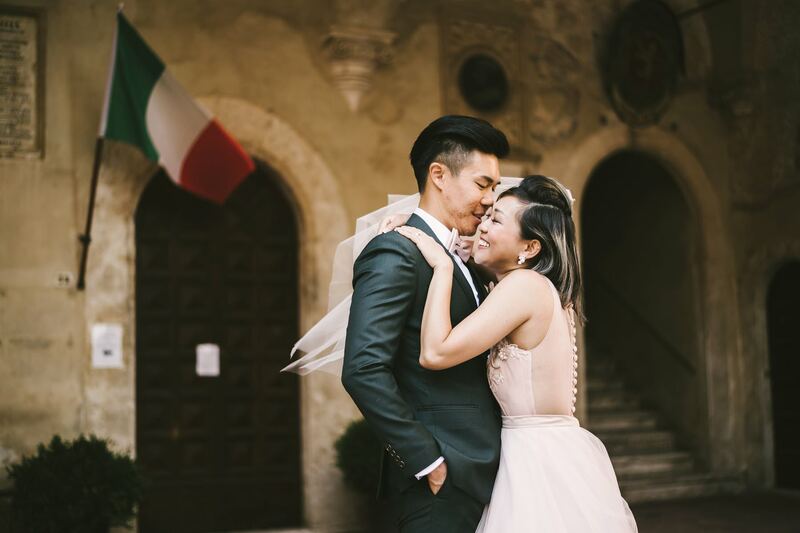 This lovely couple from Singapore chose Italy as their honeymoon destination. They couldn’t go anywhere more romantic! 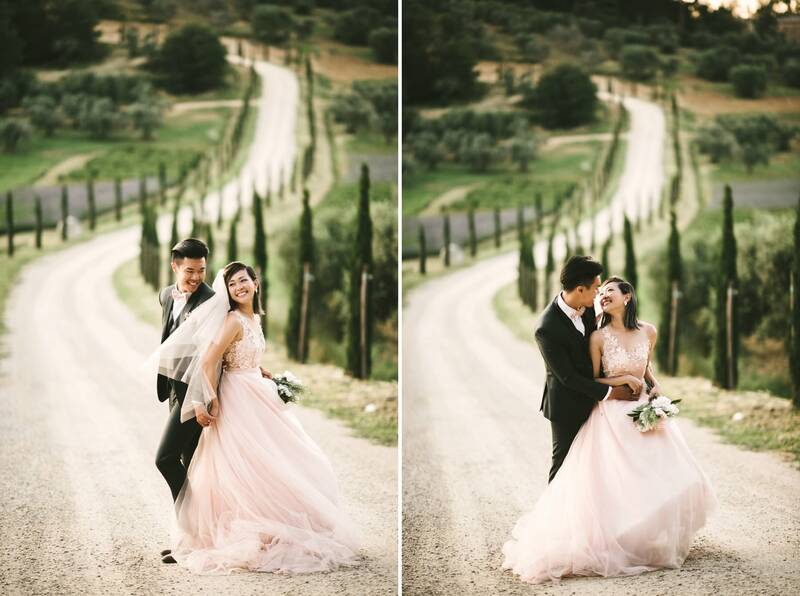 Inspired by the prewedding photo shoot I realized for their friends Melissa and Ray, they decided to have their honeymoon photos taken during their stay in beautiful Tuscany. 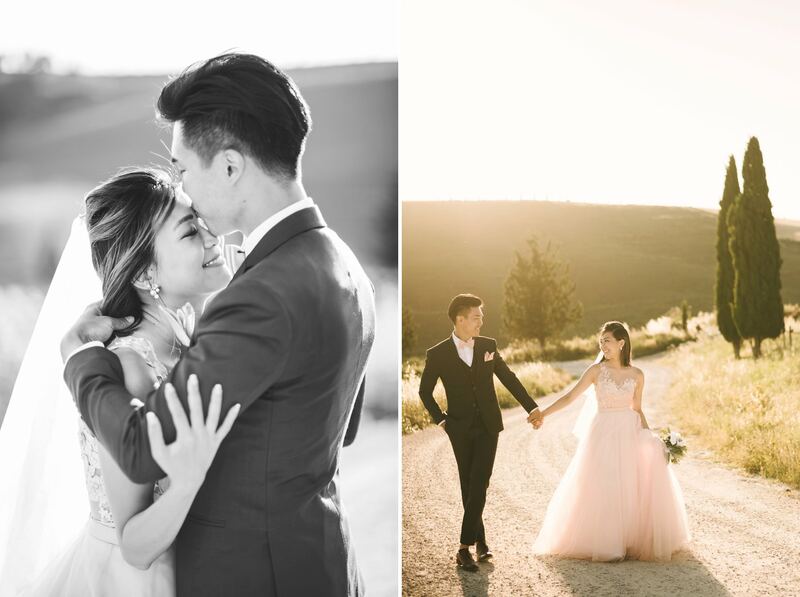 They even brought their wedding dresses all the way from their home country in order for the pictures to be even more dreamy and charming! The main location of the shooting was Pienza, a small and enchanting hamlet near Siena. It’s known as an ideal Renaissance town – and it was the perfect set for chic and elegant honeymoon photos, with its marble churches, brick houses and wooden portals. This delightful place is surrounded by the glorious hills of Val d’Orcia, where we shot some more photos in the warm sunset light. 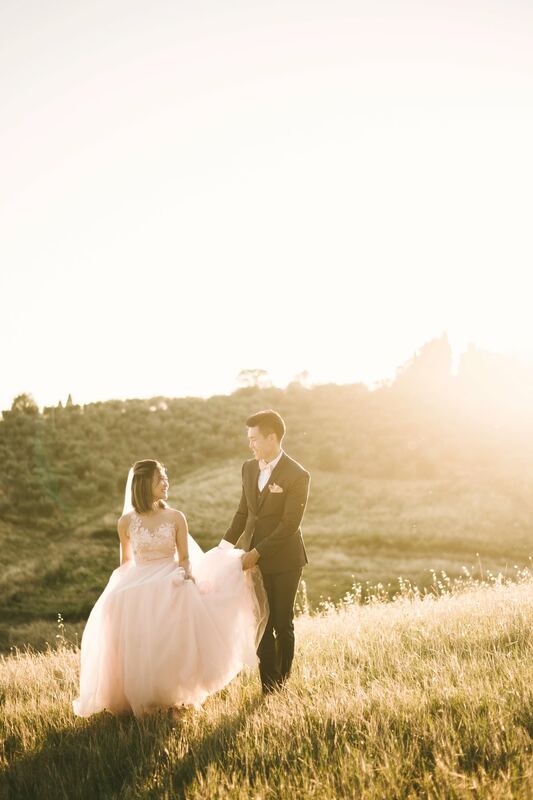 Daphne and Brendon set their love free among the green and golden wheat fields – and they will treasure their honeymoon photos forever. Aren’t you willing to do the same? 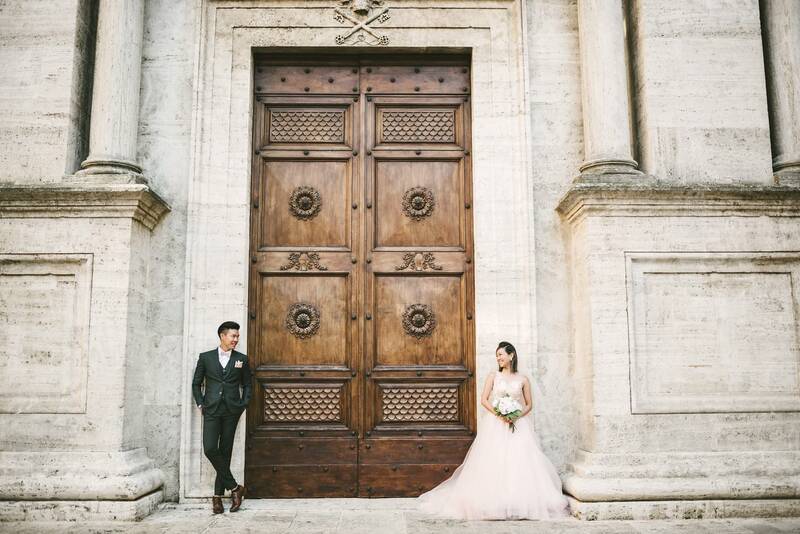 This lovely couple from Singapore chose Italy as their honeymoon destination. They couldn’t go anywhere more romantic! 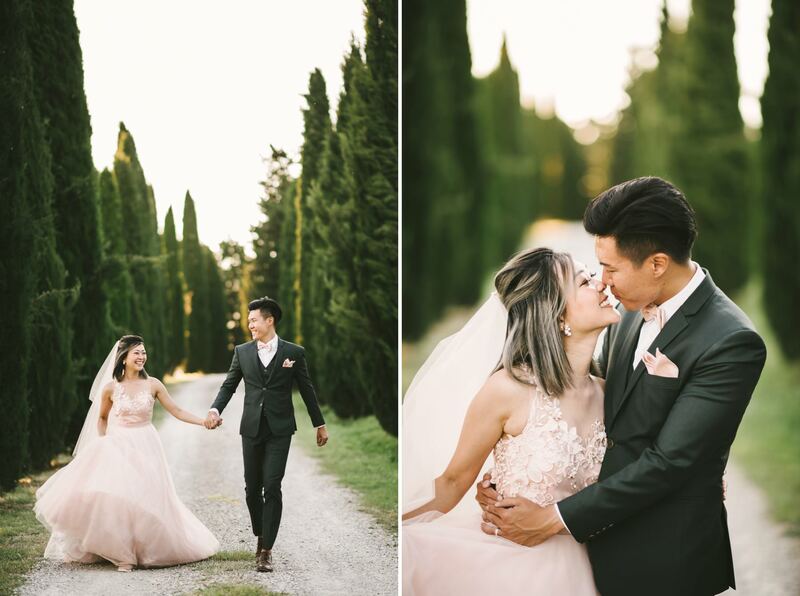 Inspired by the prewedding photo shoot I realized for their friends Melissa and Ray, they decided to have their honeymoon photos taken during their stay in beautiful Tuscany. They even brought their wedding dresses all the way from their home country in order for the pictures to be even more dreamy and charming! The main location of the shooting was Pienza, a small and enchanting hamlet near Siena. It’s known as an ideal Renaissance town and it was the perfect set for chic and elegant honeymoon photos, with its marble churches, brick houses and wooden portals. This delightful place is surrounded by the glorious hills of Val d’Orcia, where we shot some more photos in the warm sunset light. 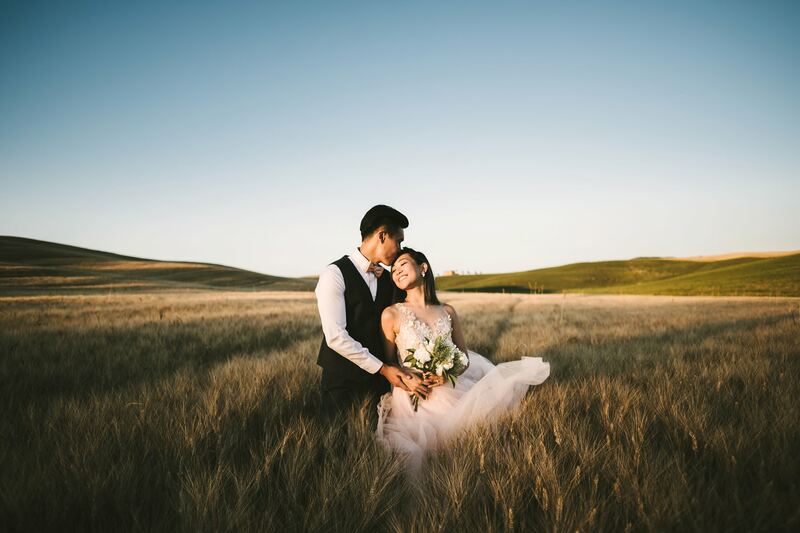 Daphne and Brendon set their love free among the green and golden wheat fields and they will treasure their honeymoon photos forever. 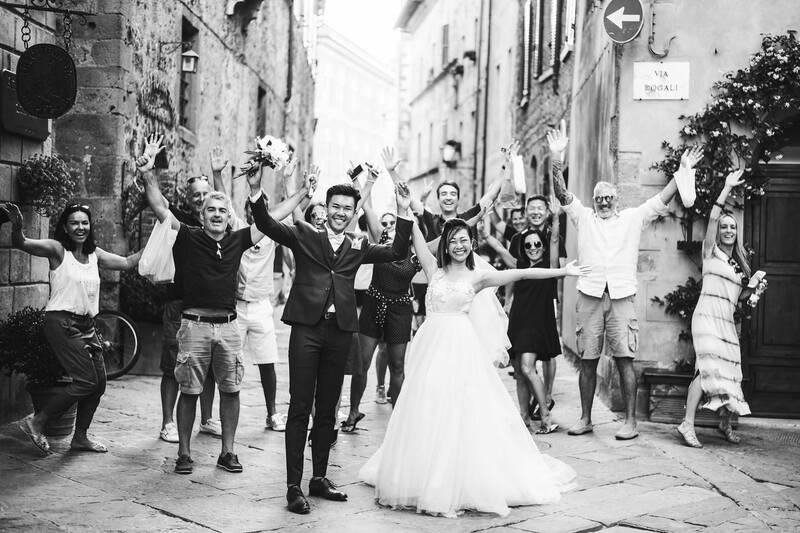 Inspired by the prewedding photo shoot I realized for their friends Melissa and Ray, they decided to have their honeymoon photos taken during their stay in beautiful Tuscany. They even brought their wedding dresses all the way from their home country in order for the pictures to be even more dreamy and charming! The main location of the shooting was Pienza, a small and enchanting hamlet near Siena. ItÕs known as an ideal Renaissance town Ð and it was the perfect set for chic and elegant honeymoon photos, with its marble churches, brick houses and wooden portals. 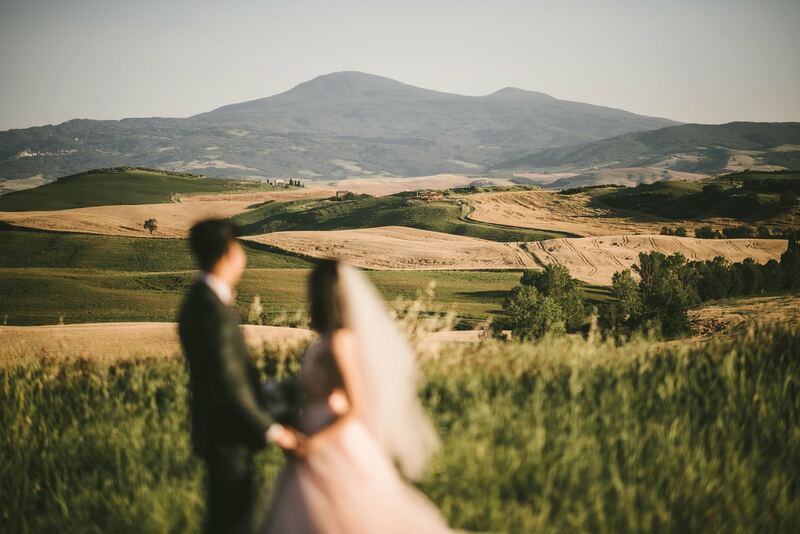 This delightful place is surrounded by the glorious hills of Val dÕOrcia, where we shot some more photos in the warm sunset light. 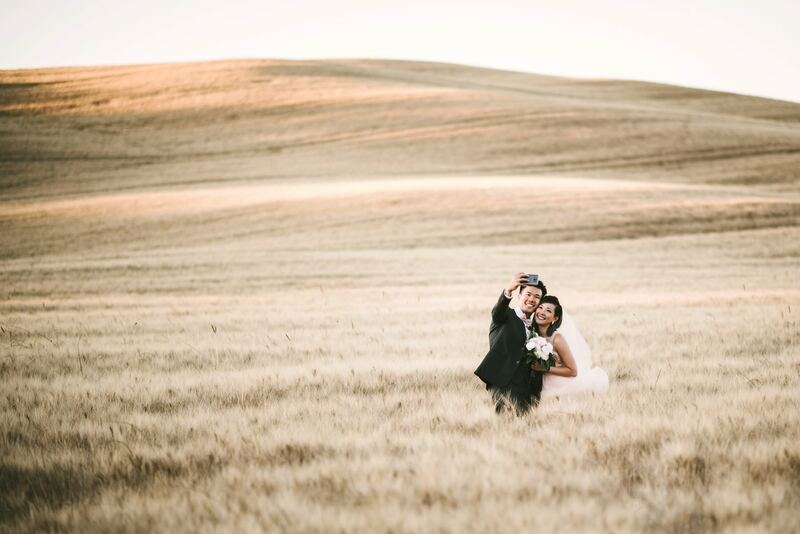 Daphne and Brendon set their love free among the green and golden wheat fields Ð and they will treasure their honeymoon photos forever. 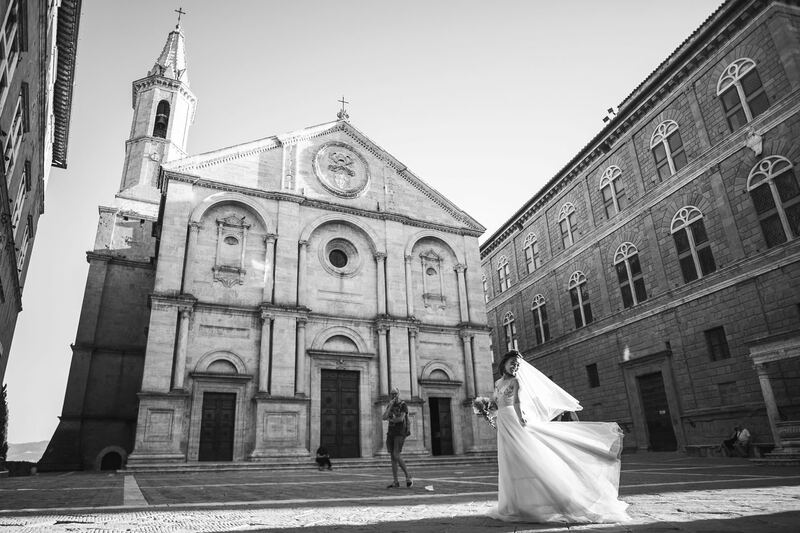 Lovely honeymoon photo shoot in Pienza Val D’Orcia by the Italian classic and elegant photographer in Tuscany based Florence Gabriele Fani. 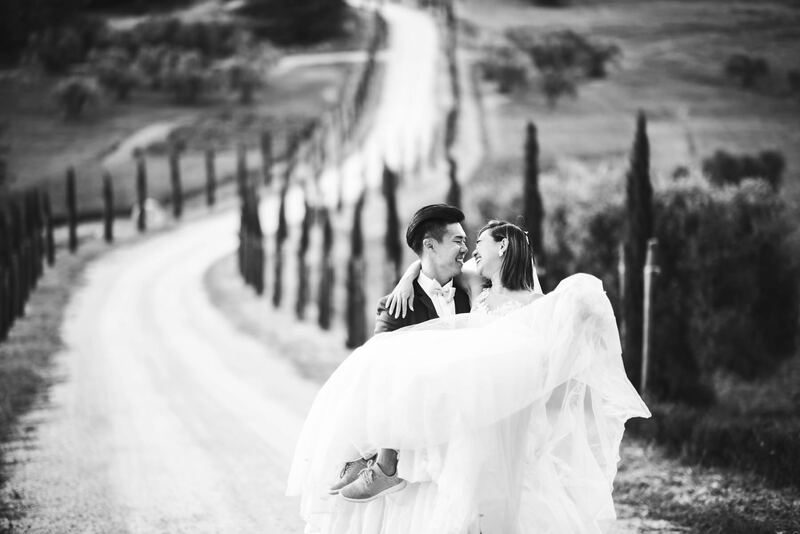 Lovely honeymoon photo session in Pienza Val D’Orcia by the Italian classic and elegant photographer in Tuscany based Florence Gabriele Fani. 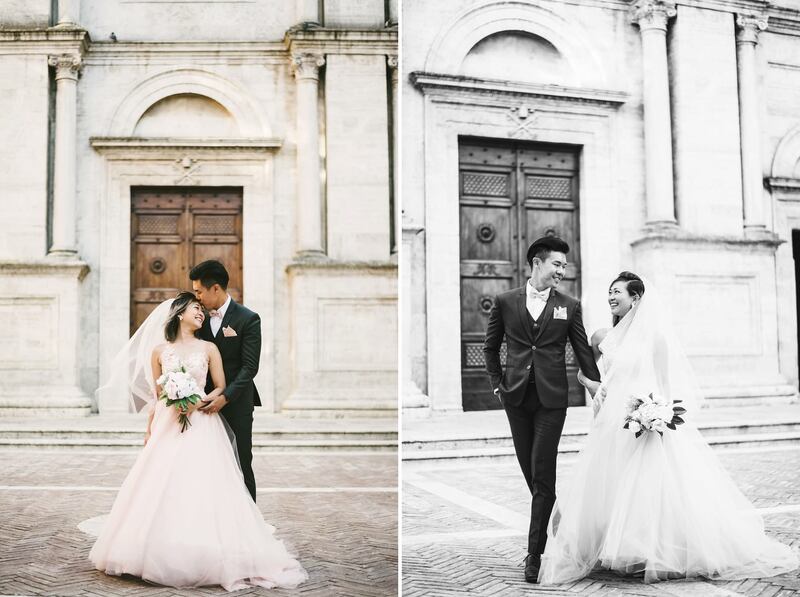 This lovely couple from Singapore chose Italy as their honeymoon destination. They couldn’t go anywhere more romantic! 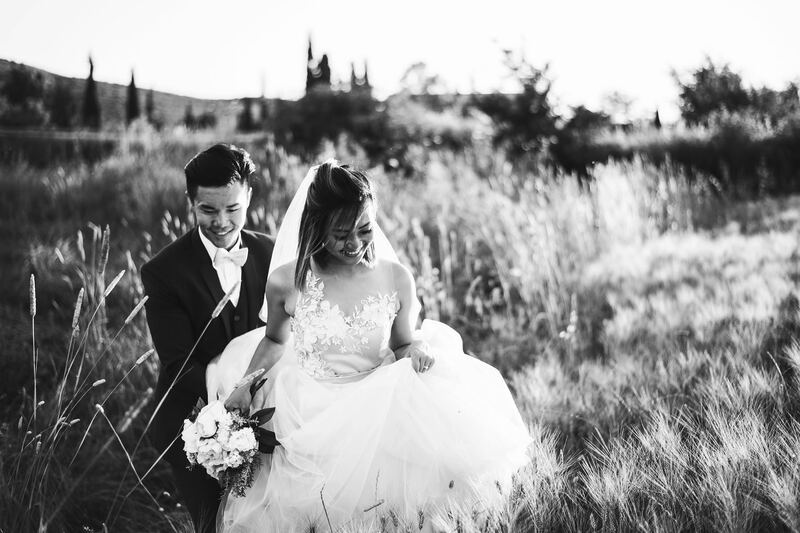 Inspired by the prewedding photo shoot I realized for their friends Melissa and Ray, they decided to have their honeymoon photos taken during their stay in beautiful Tuscany. They even brought their wedding dresses all the way from their home country in order for the pictures to be even more dreamy and charming! 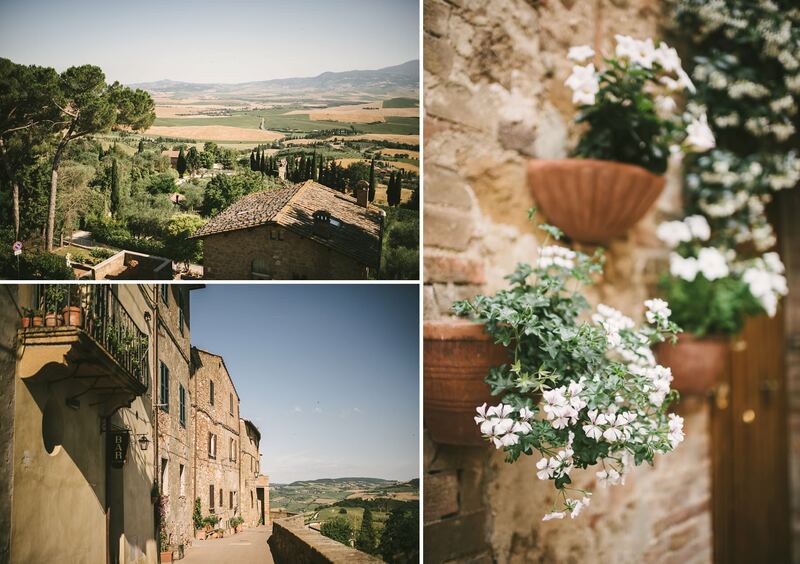 The main location of the shooting was Pienza, a small and enchanting hamlet near Siena. It’s known as an ideal Renaissance town and it was the perfect set for chic and elegant honeymoon photos, with its marble churches, brick houses and wooden portals. 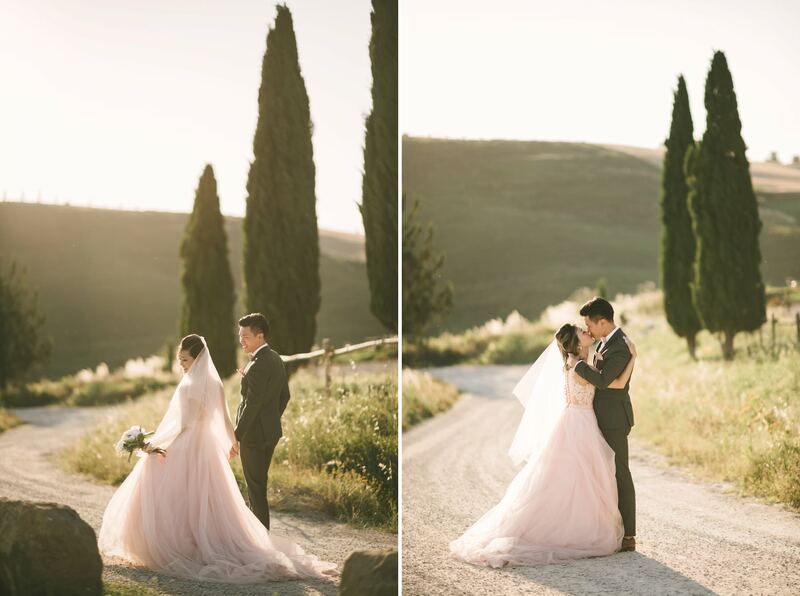 This delightful place is surrounded by the glorious hills of Val d’Orcia, where we shot some more photos in the warm sunset light. 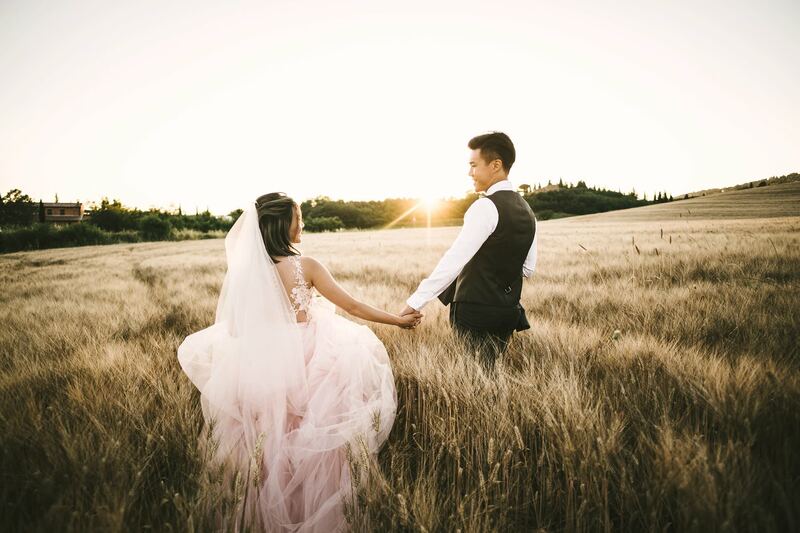 Daphne and Brendon set their love free among the green and golden wheat fields and they will treasure their honeymoon photos forever. 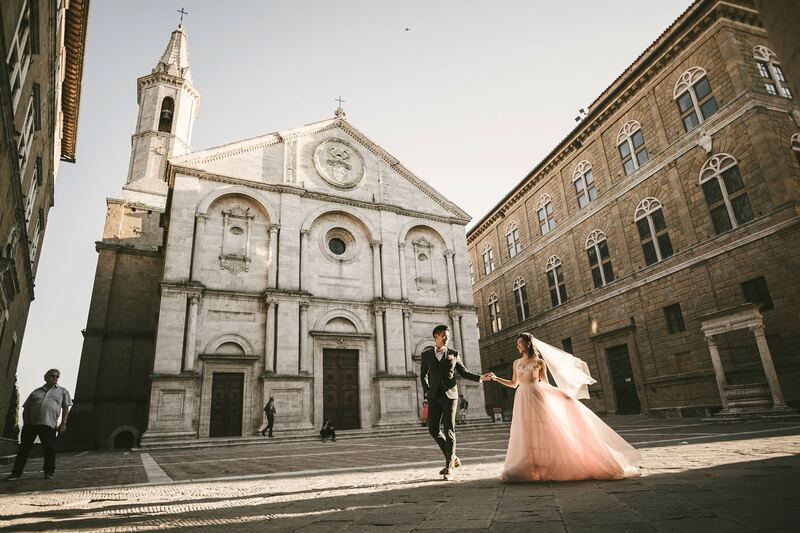 Creative and modern honeymoon photo shoot in Tuscany at Pienza by the Italian creative and modern couple portrait vacation photographer Gabriele Fani. 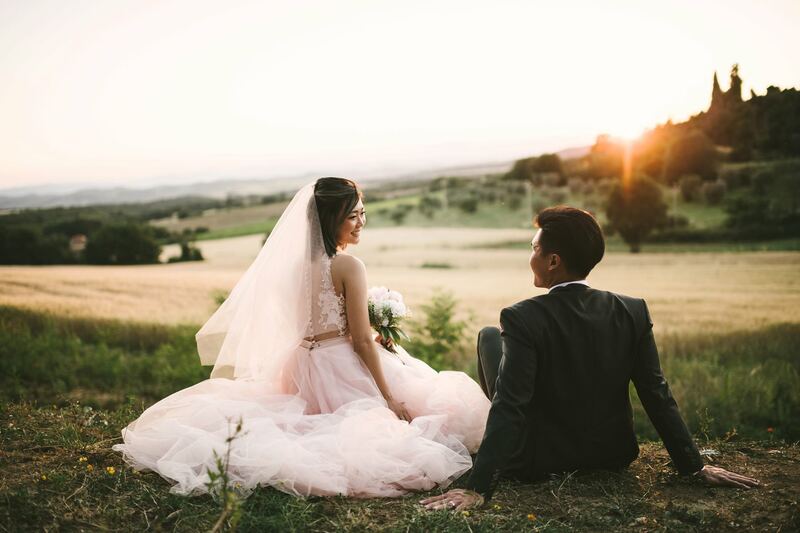 Elegant and romantic couple portrait engagement honeymoon photo shoot in Tuscany countryside by the Italian wedding and portrait photographer Gabriele Fani. 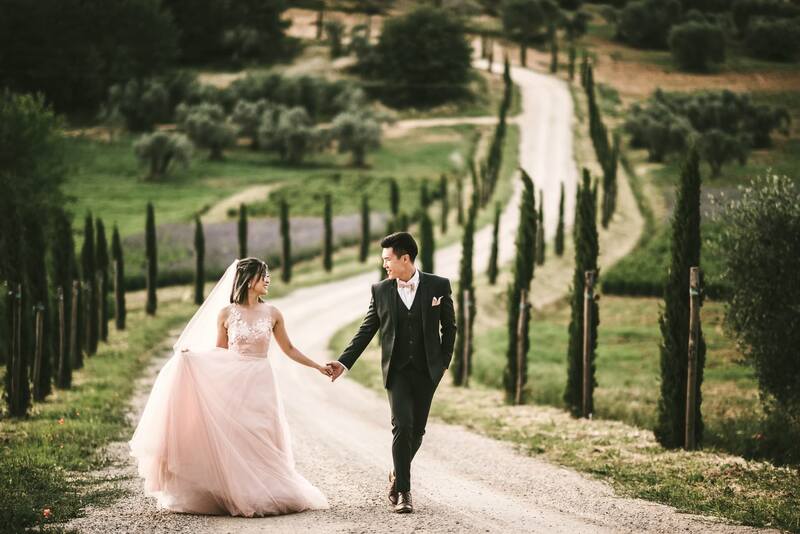 Elegant and romantic couple portrait engagement honeymoon photo session in Tuscany countryside near Pienza Val D’Orcia by the Italian creative and modern wedding and portrait photographer Gabriele Fani. 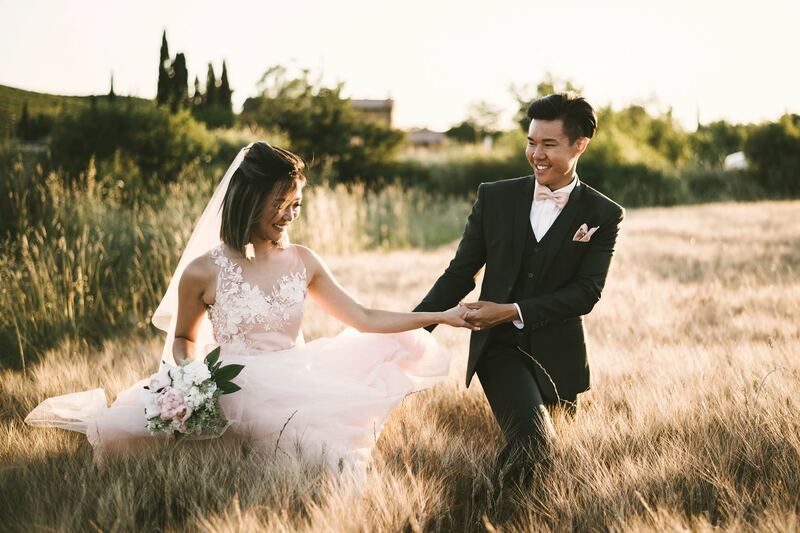 Lovely candid shoot during an elegant and beautiful honeymoon photo session in Tuscany countryside near Pienza Val D’Orcia by the Italian engagement pre-wedding couple portrait photographer in Tuscany based Florence Gabriele Fani. 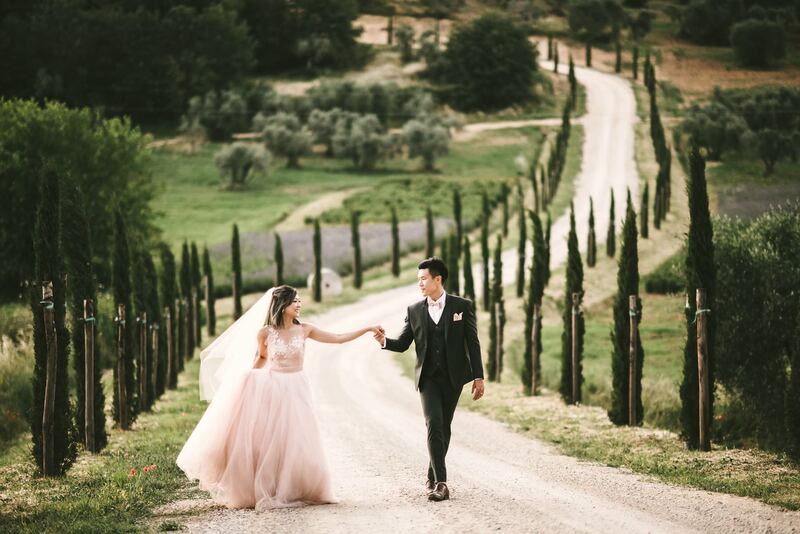 Lovely and elegant honeymoon photo session in Tuscany countryside near Pienza Val D’Orcia by the Italian engagement pre-wedding couple portrait photographer in Tuscany based Florence Gabriele Fani. 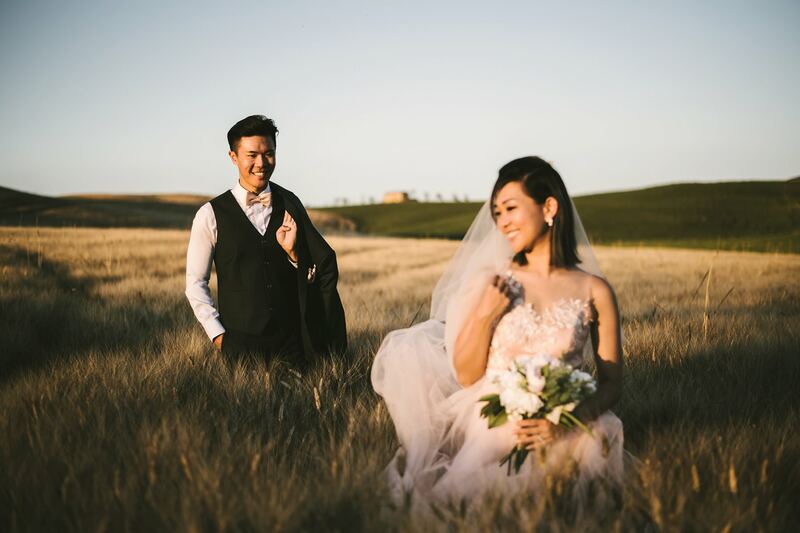 Emotional and joyful honeymoon experience photo shoot in Tuscany countryside near Pienza Val D’Orcia by the classic and elegant photographer in Tuscany based Florence Gabriele Fani. 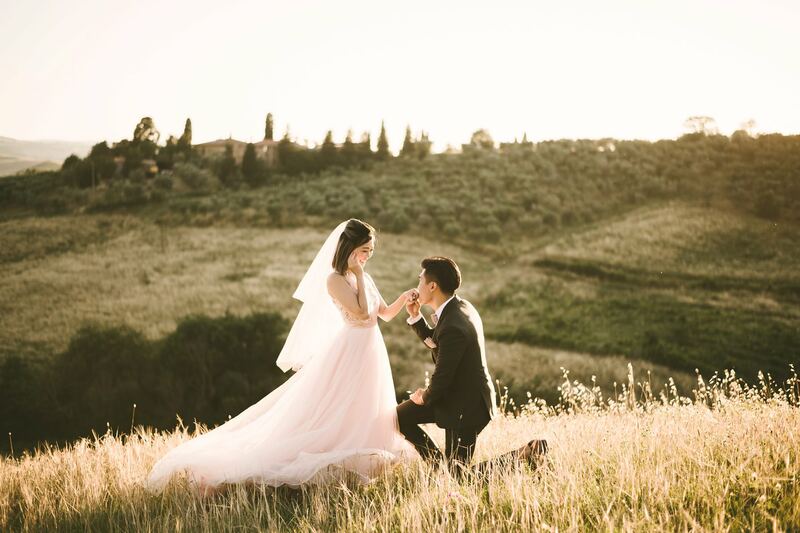 Prewedding photo shoot in Florence: romantic unforgettable memories Elizabeth and Diego’s Florence Sunrise Engagement Amaze her with a surprise wedding proposal and photo shoot in Florence! 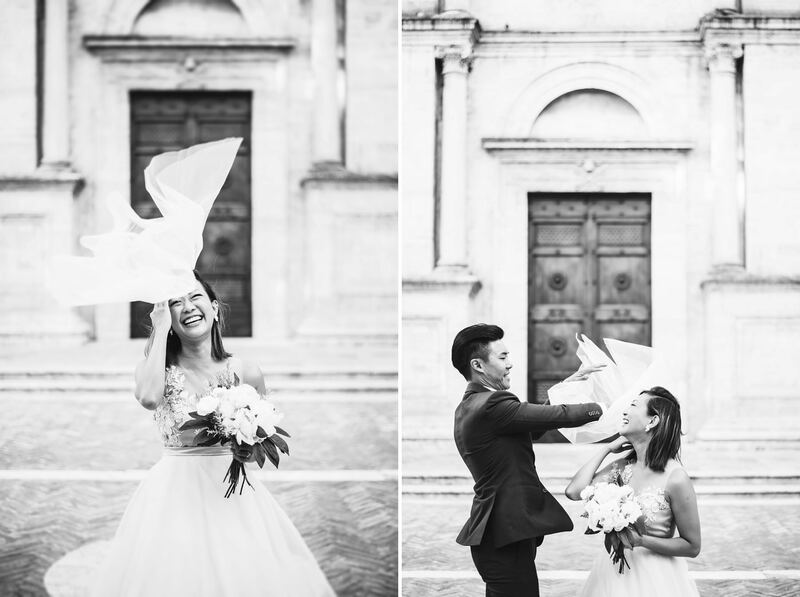 Pre wedding photos: spread your love all over Florence!